Street Machine Gte: is factory gearing low enough? Me (Robert) at the end of the road at the top of Whiteface Mtn. with my Street Machine Gte. The factory gearing (and my legs) got me and my luggage there okay. On the Yahoo Group for HP Velotechnik owners, there has been an interesting sharing of perspectives on the standard gearing for the HP Velotechnik Street Machine Gte. I would appreciate suggestions as to how long an axle should be for a triple and also, does the factory suggest any minimum / maximum sizes for the chainrings? The stock crankset on the Street Machine has 52-42-30 rings. They have used various brands of cranksets and spindle lengths over the years. To get lower gearing, I have replaced the stock 30T inner rings with 26T or 24T rings. I have also set up Street Machines with MTB cranksets with 44-32-22 rings which I think is a better gear range for a bike designed for loaded touring. When I get a new (secondhand) GT the first thing I do is change the crankset. I find the standard chainrings much too large for full camping gear touring or pulling my daughter in the trailer. I run 22, 32, 44 chainrings as said before and also use a large 36 tooth cassette giving me a very low gear. This allows me to pull the trailer up a steep gravely hill we use often on the way back from our local town. The axle length on your bottom bracket will be determined by the crankset you choose to install. Only the shell diameter and width is predetermined by the frame. As you have a deralieur post you should be fine fitting a triple. My (Robert’s) own view was the following. I tried to provide context so others may translate my experience to their own terrain and habits. I’d like to contribute to the range of perspectives about the SMGte’s factory gearing since I have a different experience. I ride an SMGte for solo, self-supported, loaded touring, carrying all gear for shelter, cooking, repairs and travel. My last tour, this past July, was a 12-day, 750-mile rainy (cycling) trip through the Adirondacks in New York State with a brief dog-leg through Vermont. I basically followed the Adventure Cycling Association’s “Adirondacks Loop.” The trip included constant and often steep elevation changes on both improved and “unimproved” roads: paved, dirt, farm, trail, mud, broken asphalt, etc. The steepest, longest incline during the trip was up Whiteface Mtn., the ski mountain used during the two Lake Placid Winter Olympics. I rode up with full panniers, which, in addition, were particularly heavy due to my having been caught in daily thunderstorms without a chance to dry my gear. From the direction I was riding, it was a 10-mile climb, in all, with long steep grades, often between 8-10% during the last five miles, and a somewhat rough winter-damaged asphalt surface. This is the elevation profile for the Whiteface Mtn. section of the Adventure Cycling Association’s Adirondacks Loop. I rode with HPV’s factory-supplied Shimano XT drivetrain with their Truvativ Tuoro crankset and their 155 mm (short) crank arms. It was okay. I believe the Elita crankset yields more power output and 170 mm crankarms would give a lower gearing, but I didn’t leave the trip believing I needed yet lower gears. The RPMs of my preferred cadence may be slower than those who prefer lower, mountain bike gearing; I, personally, seem to have better slow twitch than fast twitch leg muscles. Between me and others, there may also be differences in the weight of the payload, rider plus luggage, as well as strength. It’s important to remember that the cadence speed of one rider may be very different from that of another and that cadence will hugely effect the optimal choice of gearing. A rider with a high cadence may benefit from mountain bike gearing for loaded touring. But a rider with a low cadence may not, and may really regret losing the higher “cruising” gears, as the chain rings are all reduced in size. It is also impossible to predict the future. In this case, I mean that you don’t know how you’ll pedal after you become an experienced rider on a specific bike. When you’re new to a bike, you may pedal with one cadence, but as you get to know the bike and grow stronger, you may develop a preference for a different cadence. Also, on a new bike, you might begin with one seat angle or boom length (x-seam length) or cleat position or leg extension, and that may lead you to prefer one cadence. As you become stronger and more experienced, if you’re like many other people, you will tweak these things and those tweaks may effect cadence. Also, in my own case, I find that the time I spend in the saddle changes my preferred cadence; on long trips and long days, I seem to prefer a slow cadence. On short trips and day rides I seem be happy with a faster cadence. Maybe I don’t know what I’m doing; maybe a great coach would tune my cadence and it’d be better if I pedaled the same way always. I continue to believe it’s fine and maybe best to start with the factory’s gearing, and use that to get to know the bike and yourself as a rider of that bike. As you develop your strength and technique on a particular frame, you’ll come across instances where the gearing wasn’t quite what you needed — not high enough, not low enough, not close enough, not wide enough. Then, based on personal experience, you can experiment with your set-up and hone in on your optimal gearing. – T9 Boeshield. This is a good all weather dry lube. HP Velotechnik chain tubes have teflon particles in the tubes, so they are very low friction. Our concern is not to introduce gunk into the chain tubes. T9 is the product for that.Cruzbikes. There are a few other products I sometimes use. They’re the usual suspects: Finish Line, White Lightning, Phil’s Tenacious, etc. And I have a few other “secret” lubes that I experiment with, but, sorry, they’re secret. One not-so-secret lube is graphite dust applied liberally to the outside of the chain. Very old school, dirty as heck, and highly effective. – Fluids that penetrate and remove grease from the chain (grease is good). To clean dirt off your chain, simply use a clean dry dust-free rag to wipe off the dirt. Before all else, I should probably say, you need to start with a clean high quality chain. You can’t turn a dirty old chain into a good and efficient chain. Chains are cheap. So are cassettes and chain rings. Start fresh. High quality chains, such as those from Shimano, KMC and SRAM, have been assembled in the factory with industrial grade lubricants. So, that job has been done for you, better than most people could ever do it themselves. Generally, you just want to protect that industrial grade lubricant and keep dirt particles from getting inside the chain (inside the chain’s bushings). Dirt on the inside of the chain’s bushings causes the greatest amount of friction and wear. Corrosion on the outside (and inside) of the chain is something you want to avoid, by keeping your chain lubed. If you have chain tubes on your bike, you’ll want to dry off your chain between rain storms because moisture inside the chain tubes will cause corrosion on the outside of the chain. Dirt on the outside isn’t a huge concern in terms of performance and wear. For one thing, you can’t do much about it, so there’s little point in worrying about it. There may need to be asterisks and foot notes here (you need a clean chain before applying lube; dirt on the outside may be desirable, it actually may prevent dirt from getting inside the bushings; dirt on the outside will wear your chain rings and cassette, but you can’t stop parts wearing out, same as you can’t stop entropy; dirt on the outside of a chain may mask corrosion on the outside which you definitely do not want; the best thing of all for long term chain and “cog” life is to have a bike with an enclosed drive train, e.g., Flevobike’s Green Machine). Are you keeping all this straight? The main thing to remember is this: start fresh, apply T9. Your mechanic may have a few chain maintenance secrets too. There’s no reason not to go with whatever they suggest. “Granny Gear” banned from shop as sexist terminology. Here at New York City Recumbent Supply we have officially banned the phrase “granny gear” to describe that single easiest, hill-climbing gear on a bicycle. It’s sexist terminology and has no place in this shop. Also, I’m among many recumbent cyclists who frequently find themselves using that gear on steep hills; so what does that make me? Yes, a granny. So, from now on, that single easiest, hill-climbing gear on a bike shall be known as the “mountain gear.” That makes me, and everyone else who uses that lowest gear, a mountaineer. And I like that better. The other day I was riding errands on a Cruzbike Sofrider. This isn’t a story about the Sofrider. It simply so happens that this has been my city “beater” bent for the past month. I was somewhere between Brooklyn and Manhattan (like on the Brooklyn Bridge) when I felt that distinctive looseness that can only mean one thing: loose seat bolts. I don’t have a lot of mechanical problems, but one I do seem to have, and always at the more inopportune times, is loose seat bolts. The last time this happened was road-side in the Taconics while riding a StreetMachine Gte with the 8-bolt BodyLink seat. That time I had tools. This time I didn’t (let that be a lesson), so I began making alternative plans: go to a bike shop and beg an allen key for my cool bike? Try and “be careful”? Ultimately, in spite of having about 25 miles of errands to run — or ride — and very, very slowly so as to try and diminish the loosening of the bolts — I was home before the bolts shook entirely loose. Thank goodness. By the time I took an allen key to them, both seat pan bolts were nearly — but not quite — too loose for comfort. Unlike standard frame bikes, where there are generally only two seat bolts that can come loose, a recumbent usually has several, and they are usually small diameter bolts with low torque values. I’ve had seat bolts come loose on me on just about every brand of bike, so it isn’t only a problem for certain brands. It’s just a recumbent thing, sort of like The Smile. Here’s the preventative maintenance tip of the day. Seat bolts become loose through ordinary use. That means using Loktite threadlocker blue. Remove all the bolts on the bent seat. Apply the Loktite. Screw the bolts back in. You’re done. For now. Is it me? Or is it the bike? Sometimes, when you’re struggling to fine-tune a system, it’s hard to figure out where the fault lies. In this case, I’d been struggling for — I won’t say how long — to align the disk brakes on a Hase Pino tandem that’s new to my shop. No matter what I did, how often I repeated my efforts with slight variations, or how hard I stared at the darn thing, I just couldn’t get the disk brake pads and get rid of the scraping between the front wheel disc brake rotor and the brake pads. It made no sense. Is this an Avid issue? A Hase issue? A moi issue? It got to the point where I simply lost all patience and went and rode it anyway, scraping and all. I grabbed the nearest friend and we rode for a half-dozen miles just to see how the bike handled. (That Pino is very cool, by the way. Wow.) However, being concerned about vapor lock, we kept it to a reasonably slow speed. Now, all that slow speed stuff is over. If you have a Hase Pino with Avid Code hydraulic disk brakes that you just can’t align, look for this, among the other typical things to check. Caliper Positioning System™ (“CPS”) were loose. This thwarted the CPS from aligning the calipers correctly to the rotor. If you have the same problem on your Hase Pino, do this: first, unfasten the left hand front fender mount so the hose can move freely. Then proceed as per the directions in the manual. It aligns as designed. Arrow pointing out the culprit. I didn’t have a free pass on the rear wheel either. The disk rotor was rubbing a lot less than the front rotor, but, still, more than it should. (I like it not to rub at all.) I checked and, sure enough, there was a culprit: a hose clamp that pulled the caliper a little out of alignment when the CPS bolts were loose. I unfastened it, followed standard procedure, and voila the caliper aligned as it should. Hard-to-see arrow, in middle left of photo, pointing at culprit. Long and short, so was it the bike? The brakes? The mechanic? I suppose it was the human, once again, for I was the only element that had the capacity to look at the problem differently and change my approach. Interested in a few tips on installing fenders on a SWB ‘bents? > shortening them? I looked through my toolbox and couldn’t find anything that would do the trick. hmpf. Meet your friend, the hacksaw (or bolt trimmer). A finished bike would ideally have trimmed fender stays with end caps. That said, some people prefer not to cut the stays if they can get away with it — if they do not get in the way or catch on anything. This allows one to retain flexibility for alternative set ups. A little advice that you may already know, but it’s important: be sure to leave a good amount of clearance between the fender and tire. This is so nothing typical — small stone, bit of sticky trash, leaves with twigs — can easily lodge in there and jam the wheel. I like to leave about an inch — about a penny’s diameter — between the tire surface and the fender. For me, fall leaves and stones are the most common catch (see photo. Shown: HP Velotechnik Grasshopper fx). 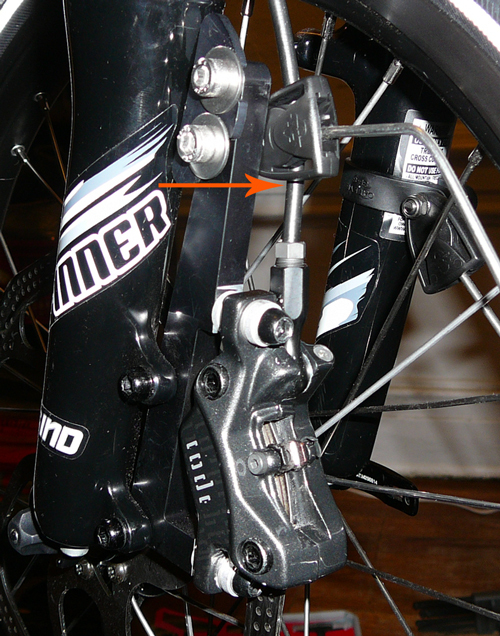 The advice here relates to fenders that allow easy length adjustments. There are also common fender designs that use stays in the shape of a “shepherd’s crook” (see drawing). Other common designs have a fixed length rod and a plastic end piece that screws onto the fender. These types of designs don’t allow easy adjustment for clearance but do allow for a welcome break-away quality if something large gets stuck between the fender and tire. At times, Rans has supplied fenders with these types of stays for their bents. Generally, I recommend riders look for designs that allow as much flexibility as possible since bents vary a lot in their geometry and do-it-your-selfers may need to manipulate off-the-shelf fenders. At the same time, I also recommend using, at least initially, whatever a manufacturer recommends or supplies, and then make upgrade decisions from there, based on personal experience with the product.